We've been sent word from the folks at WEC that Stephen Foord - The 2009 Wiesner Insurance Canadian Trials Champion has gotten some recognition from the Sherco factory. They've sent us what looks like a scanned copy of document Sherco created for them. It's missing some of the detail on the left and right sides, but, you get the picture. Sherco is giving some deserving credit to Stephen. World Enduro Canada would like to congratulate to Stephen Foord - The 2009 Wiesner Insurance Canadian Trials Champion - on recieving recognition for his efforts from the Sherco Factory. 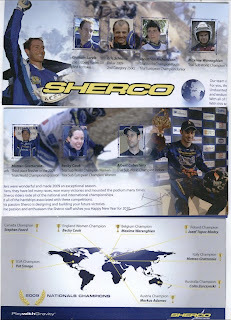 Sherco created the attached document to recognize its champions around the world. Now that Canada has a true national trials series the competitors can finally attract the attention they so richly deserve. Way to go Stephen!